BRIDGEPORT — At long last, Marz brews have emerged from an underground storefront and into the taps of local bars. "It's kind of like, 'Wow, we made it. We've arrived. The dream is now,'"joked Eric Olson, one of about seven part-time brewers working their magic at Marz Community Brewing, 3315 S. Halsted St. The Bridgeport brewery, which started as sort of a beer club for homebrewing aficionados led by Ed Marszewski, went legit earlier this summer when the federal government OK'd its brewers license. Now, drafts of Marz beer can be found at higher-end beer joints like Dusek's Board and Beer in Pilsen, Logan Square's Owen and Engine, the highly-acclaimed pork and oyster house The Publican and their home base of Maria's Community Bar. Bottles are coming soon — the labels first need to be approved by Kent "Battle" Martin, a federal Tax and Trade Bureau employee and the one guy who approves virtually all of the nation's beer bottle labels. 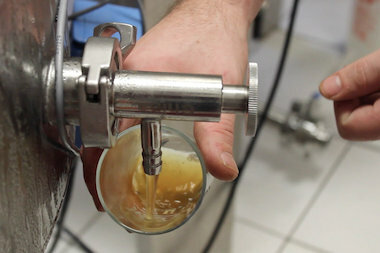 Most of the Marz brewers have full-time days jobs, so the group converges at the hidden-in-plain-sight brewery on nights and weekends to perfect recipes for their specialty beers, a combination of craft stalwarts like pale ales and porters but also some more fringe recipes, like the "Smoke Wheat Every Day" Gratzer made with smoked oak wheat and a "Bubbly Creek" Berliner Weiss that comes in two varieties, made with Japanese yuzu fruit or chardonnay. "They're weirdo beers. A lot of people love them now," said Tim Lange, 32, a Logan Square resident and home brewer who "stalked and emailed" to become part of the Marz crew. Part of the brewers' inspiration comes through collaborations with other like-minded craft connoisseurs. A recent mashup with Kentucky's Against the Grain brewery, for example, yielded a stout aged in soy sauce barrels for a savory umami flavor and the Marz crew will soon brew the "Lazy Susan" American Strong Ale, a recipe from the winners of their recent homebrew contest that drew 22 entries from across the Midwest. Still, for all of the big flavors, the Bridgeport operation is decidedly small. During a recent visit, reggae music pumped through the brewery, a converted apartment building that's become part commercial kitchen, part science experiment. As the burners flared under giant pots of mash and the temperatures rose to sweaty levels, Olson and Lange hinted at a brewery expansion and dreamt out loud of producing more beers but keeping the integrity of their unique product. "This can be a lot of labor for not a lot of beer. We've done 12-hour days making like three barrels of beer," said Olson, who also tends bar at Maria's. "I just can't keep enough of this beer at the bar."